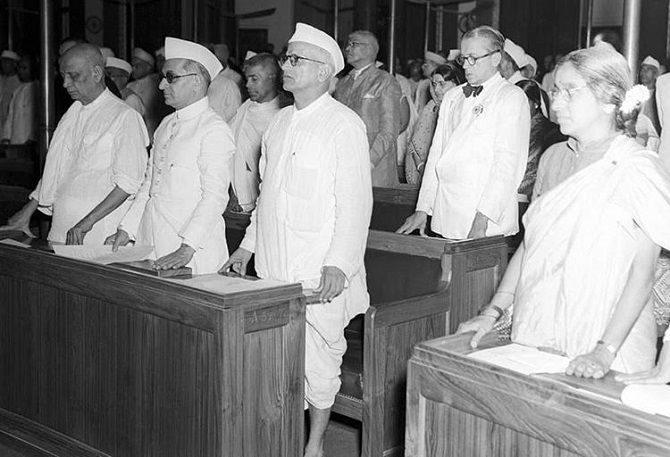 'They are symptomatic of the sad days that have befallen the nation midwifed and contemplated by Nehru and Patel,' says Mohan Guruswamy. Narendra Modi inaugurated the giant Sardar Patel statue facing the Narmada dam, 3.2 km away, on the river island called Sadhu Bet near Rajpipla in Gujarat. Standing almost six hundred feet tall, it is the world's tallest statue. The project began in December 2013, and is probably the only achievement the Modi government has to show. The project worth Rs 2,989 crores (Rs 29.89 billion) was won by Larsen and Toubro. Initially, the total cost of the project was estimated to be about Rs 3,001 crore (Rs 30.01 billion) and was paid for by the Government of India. Initially Modi flagged it off as to be built by small contributions and crowd funding, but like all his other projects the means were actually something else. The statue was as much a bold assertion of Gujarati nationalism as it was to give Narendra Modi a political lineage to distinguish him from the parent RSS which sat out the freedom movement. Please note he didn't build a statue of Guru Golwalkar or Deendayal Upadhyaya or even V D Savarkar. Or for that matter even Subhas Chandra Bose who still has a far bigger imprint on our minds than Vallabhbhai Patel ever did. After Modi's brazen attempt to draw political sustenance from the memory of Sardar Patel, an unseemly argument has broken out between the Congress and BJP over who are the true inheritors of Sardar Vallabhbhai Patel's legacy. That the BJP's not so disguised attempt to arrogate it for itself in a bid to give itself a nationalist movement genealogy is a tawdry attempt to rewrite history. What Sardar Patel thought of the RSS is a matter of record. He minced no words about what he thought of it -- that it was fascist and narrow minded, and was responsible for the climate of hatred that led to Gandhiji's assassination. The RSS now has the government, but it still presents a clear and present danger to the original idea of India, as an inclusive, egalitarian nation united by a Constitution and a shared purpose. Modi has invested hugely in creating the illusion that the Congress party's preferred leader was the Sardar and that Nehru was imposed on it. Nehru became PM because he was by far the Congress's most popular politician, after Gandhiji. Nehru was the party's star campaigner, captivating people with his soaring oratory and easy communication style in Hindustani. Patel might have had a firm grip on the Congress organisation, but he was far behind Nehru in popularity and charisma. Patel's realism was the hallmark of his politics and that made him the perfect foil to Nehru's idealism. It is also well known that the Congress had little time for the Sardar's legacy till Narendra Modi tried to don it. But the Congress's attempt to rediscover the Sardar's legacy and claim exclusive rights over it is also no less tawdry. Even when L K Advani tried, it was not taken seriously. But like the Sardar, Modi too is a Gujarati and that has a certain resonance in that state. We know how strongly Modi feels about the Gujarati identity. His unwillingness to insure the Asiatic lion against extinction by translocating a few prides emanates from this. 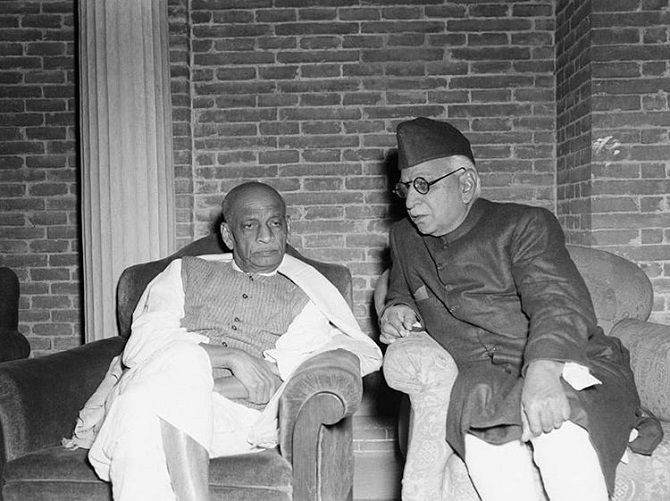 It is well known that there were serious differences between Jawaharlal Nehru and Vallabhbhai Patel. It was less a clash of personalities as it was a clash of ideologies. 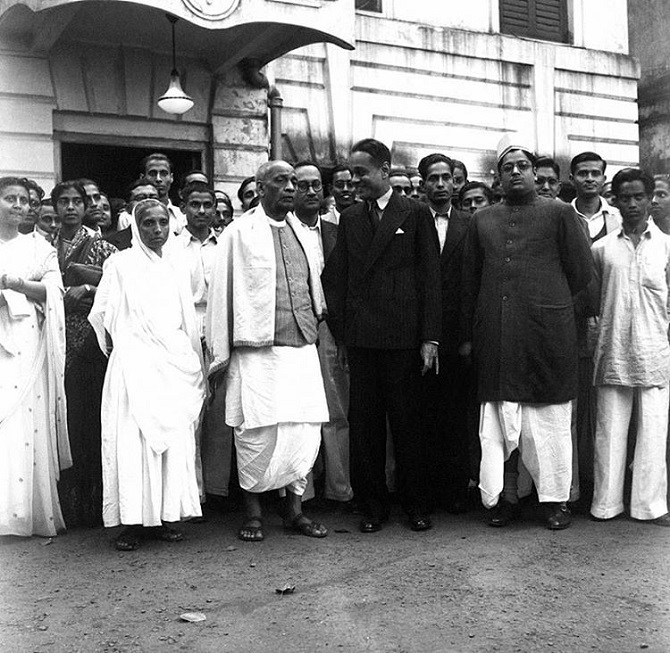 The Sardar espoused a more robust and practical nationalism, and laissez faire economic policies. 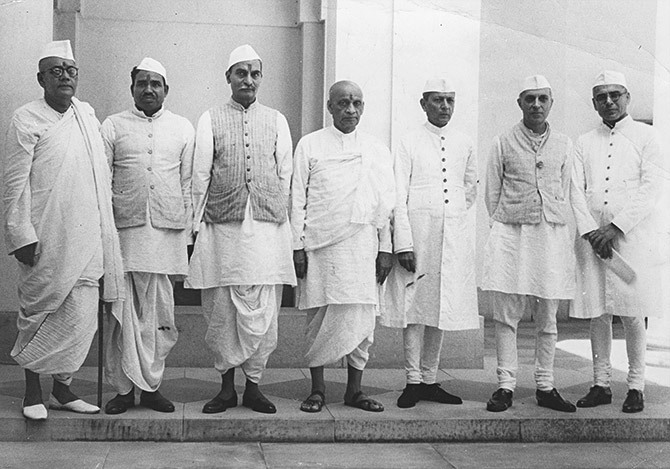 Nehru wanted to dismantle the colonial bureaucratic system, but Patel wanted to retain the centralised civil service structure, the price for which we are still paying. Nehru was more internationalist, more leftist than realist, and preferred central planning to free market policies. Their policy inclinations were as different as chalk and cheese. But both were patriots tempered by the nationalist movement and both were popular leaders of the Congress rank and file, and the nation as a whole. Above all, both were thorough gentlemen and whatever their differences never disrespected each other and subverted each other with factional intrigue. They preferred a moderation in language that would now been seen as a sign of weakness. They preferred to conciliate rather than divide. It is also well known that after the death of Sardar Patel, something akin to a purge took place in the Congress and the Congress leaders who preferred to support the policies and politics espoused by the Sardar were shown their place or shown the door. The party donned socialist colours and its transformation was complete. 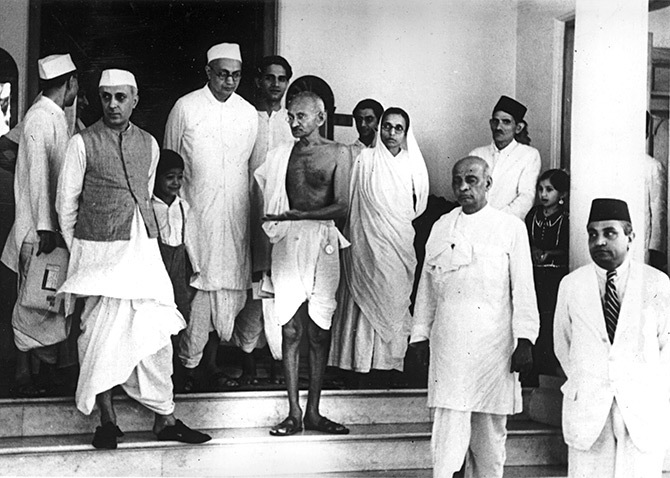 With this physical purge, the intellectual purge of the Congress party also gathered pace, and Sardar Patel was practically airbrushed out of the Congress pantheon. For all practical purposes Sardar Patel became anathema for the Congress party, particularly after the advent of Indira Gandhi. It's another matter that after its ideological peregrinations for half a century, the Congress party returned to the very same laissez faire economics favoured by Patel and rejected by Nehru. Congress leaders who now claim to be legatees of Sardar Patel would hardly know of him and what he stood for. For a start their language is different. Those days they belonged to a very different school of politics. Politics was about policies and grand ideas. To qualify in politics nowadays, one has to be a graduate of the school for scoundrels, where sycophancy and personality worship are the main attainments needed. 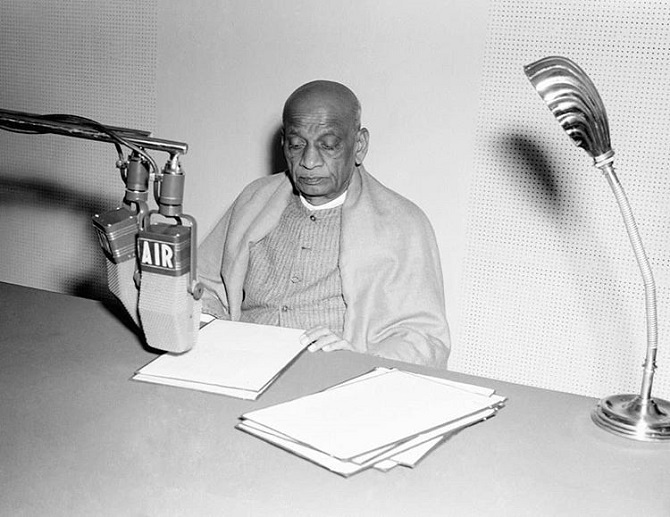 Sardar Patel had a thriving law practice he abandoned to heed the Mahatma's call, Jawaharlal Nehru was a superbly educated and highly evolved personality, and politics to him was a calling not an occupation. Neither Narendra Modi nor Rahul Gandhi has much in them to claim such legacies. They are symptomatic of the sad days that have befallen the nation midwifed and contemplated by Nehru and Patel.